Pasta e Basta is a restaurant situated in Amsterdam, in the old part of the city, and is perhaps the most unusual and entertaining restaurant I have been to. No its not the food you go to Pasta e Basta for – its the waiters. Young students hopeful of a singing career from the Amsterdam Music Conservatorium wait on your table and every now and then break into song singing an Italian aria or a pop ballad. 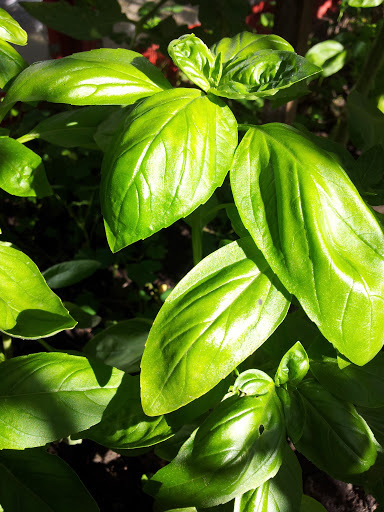 Maybe it was the Italian arias or the romantic notion of being like an Italian mama making long threads of pasta from my kitchen that influenced my decision to purchase a pasta maker. Two years have passed and I haven’t managed to get it out of its box. I decided to gift the Italian pasta maker to my friend Jan. 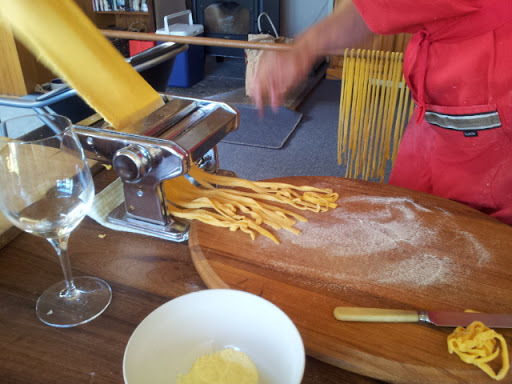 Imagine my delight when we walked into Jan’s kitchen in Christchurch to witness the pasta making in progress and later enjoyed the fresh pasta full of the flavours of summer. 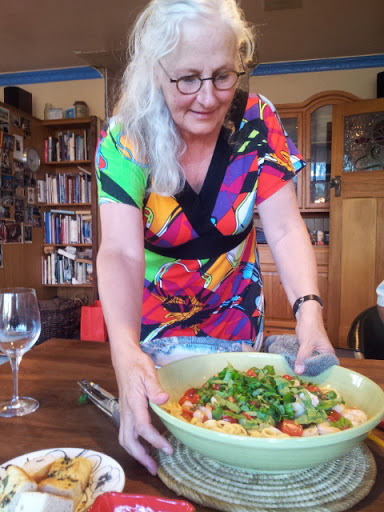 Jan had waited for our arrival to complete the pasta making so that she could show me just how easy it is to make pasta. 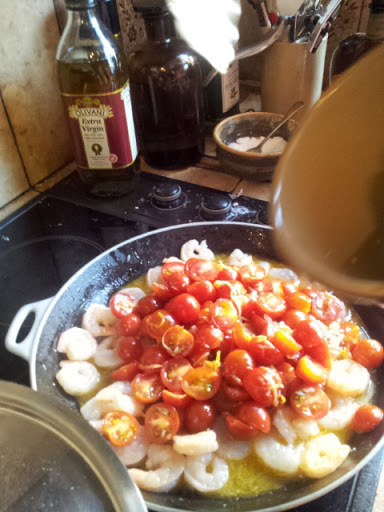 The sauce Jan made is simple, quick and delicious and you can make it as a quick meal idea with commercial fresh or dried pasta. 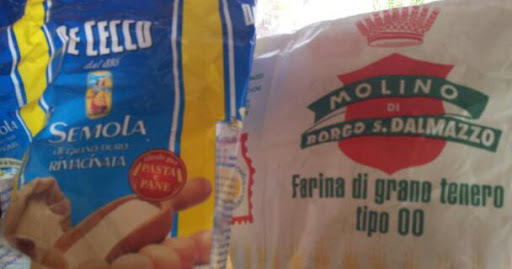 You can make pasta out of ordinary flour but to increase your chances of a successful pasta you need to use Italian flours. Jan used 50/50 Semola (which has the same texture as fine corn meal) with 00 grade very fine Italian flour. 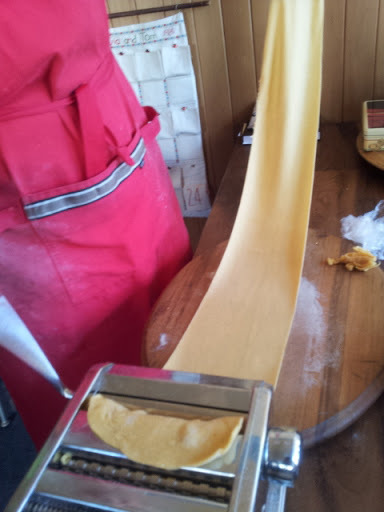 For every 100g of flours add one egg – Jan used 200 g of Semola and 200g of 00 Italian flour with four eggs – no salt required as the pasta is cooked in salty water. 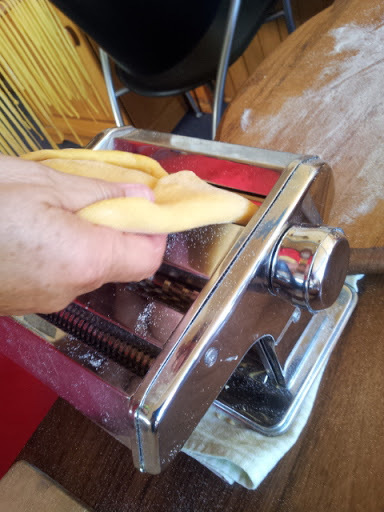 You can mix the Italian way on a large board or benchtop by hand but Jan used the Kenwood mixer with the dough hook and this saves time and mess. The eggs should be enough for the flours to form a soft dough – if not no more than a flick of extra water is required. You need to sit the dough for at least an hour before rolling. Jan stored the dough in the fridge overnight. 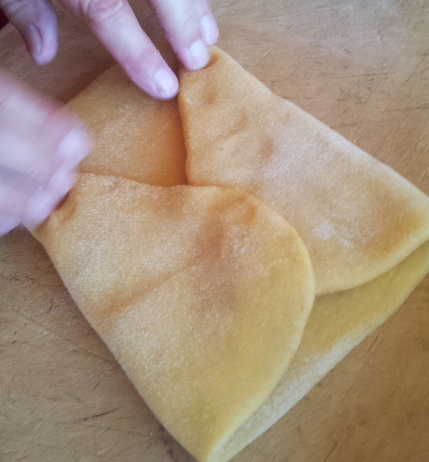 Next process is called booking – you fold over both ends of dough to centre – just like a book! 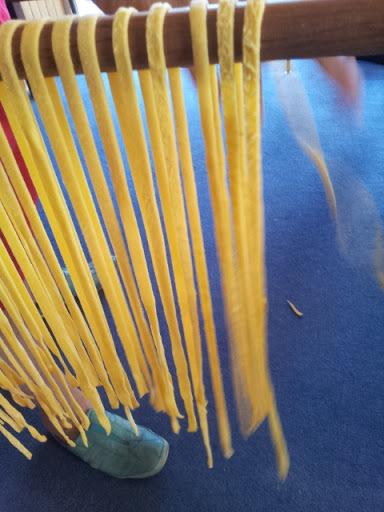 Pasta now hangs on a stick to dry and set and is ready for cooking. 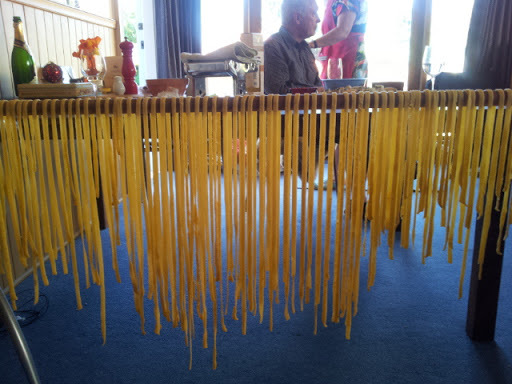 You can also use coat hangers to hang the pasta. 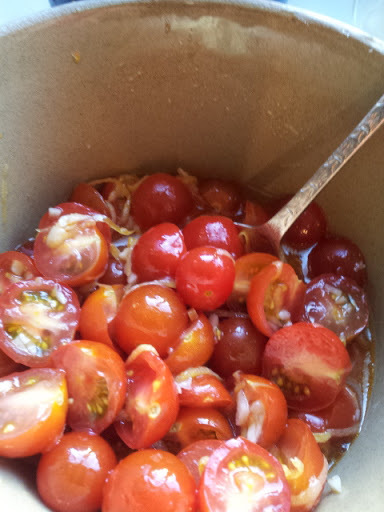 Cut up a packet of cherry tomatoes, add 1 Tbsp of chilli oil and 2 cloves of finely chopped garlic (if you don’t have chilli oil just use a chopped chilli or chilli concentrate) with the zest and juice of two lemons. 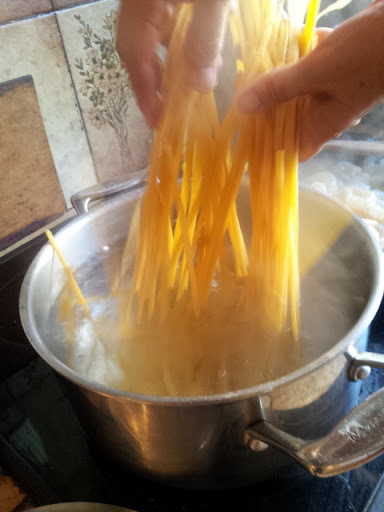 Add 1 tbsp of salt to boiling water and then gently add the pasta to ensure the water keeps to a rolling boil – the pasta only takes 2-3 minutes to cook. 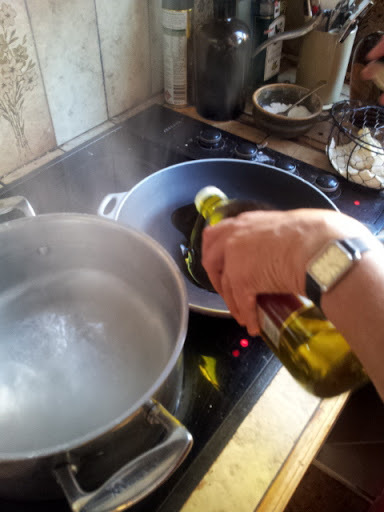 Strain and run over cold water to stop further cooking. 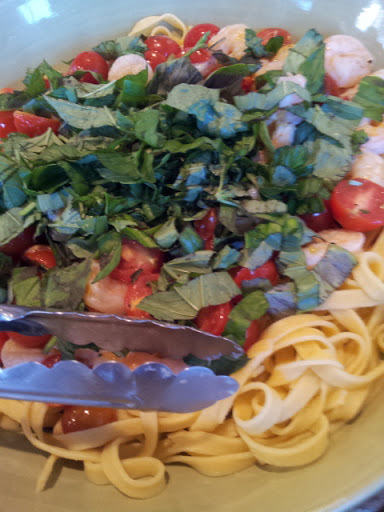 Serve with layer of pasta, tomato mix and chopped basil. 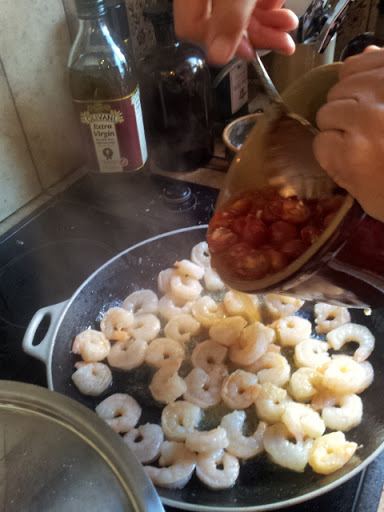 If you are not fond of prawns you could replace with courgette or eggplant for a summer vegetarian pasta dish and a good finishing touch would be a grating of parmesan cheese. The courgette and eggplant needs to be cooked longer at a lower temperature. 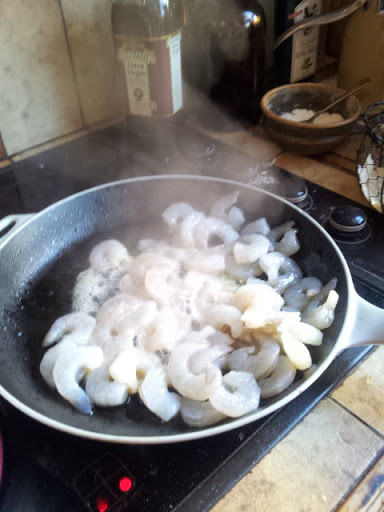 You could also opt to use other fish instead of the prawns. 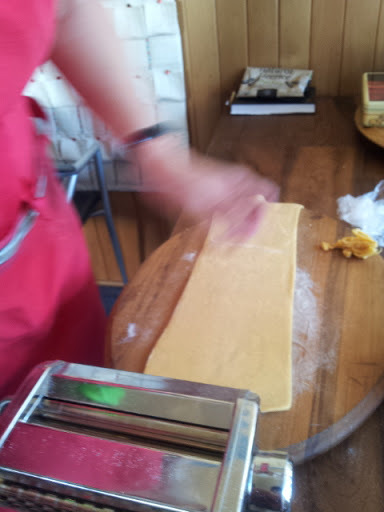 Making pasta does take time but the edible result is much better than what you can buy. It’s an absorbing process to watch and could be part of a social gathering with friends. 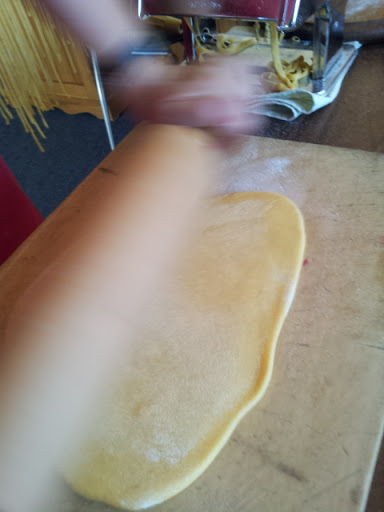 Jan was shown how to make pasta and in turn showed me. I am now passing this on to you in the hope that you might get that pasta machine out of the cupboard, or borrow a friend’s machine and give it a go. I won’t be making pasta in the short term but I will certainly make the sauce again.